A classic panna cotta. Photo by Rafa Saidi Granados | The Nibble. Discover all types of custard. 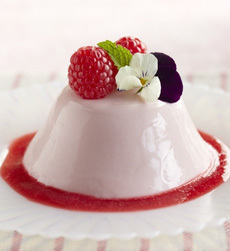 This page includes terms such as mousse, mousseline, panna cotta and pot de crème. A clear, odorless and flavorless setting agent derived from animal bones. It is used to set cold desserts such as mousses and bavarian creams. Strict vegetarians and kosher people who do not consume any animal products use vegetable setting agents, including one made from agar agar, an algae. A half cup of macaroon crumbs is folded in to the custard prior to baking. A French term meaning “froth” or “foam,” mousse is a rich, airy custard made of whipped cream, eggs and gelatin that can be either sweet or savory and hot or cold. 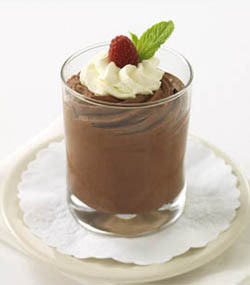 Cold dessert mousses are usually made with fruit purée, a spice (vanilla, almond) or other flavoring such as chocolate. A mousse is light and airy due to the addition of whipped egg whites, whipped cream, or both. Fruit mousses are usually fortified with gelatin. 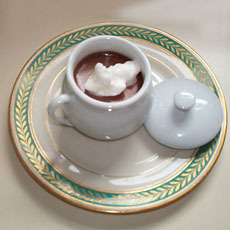 Mousses are too soft to mold into a semi-rigid form, so they are usually piped or scooped into the final dessert presentation and garnished with additional whipped cream prior to serving. Savory mousses can be made from meat (ham, chicken, veal, e.g. ), fish, shellfish, foie gras, cheese or vegetables. Hot mousses usually get their light texture from the addition of beaten egg whites. They’re generally baked in a bain-marie to prevent the mixture from curdling. In savory cooking, a mousseline is a sauce made by folding unsweetened whipped cream into a hollandaise. In sweet dishes, it refers to a buttercream lightened with crème pâtissière that is used as a filling for cakes and pastries. Translation: eggs in snow. See floating island. See crème pâtissière. This is the form of custard used to fill cream puffs and éclairs. Italian for “cooked cream,” it is a light, silky-smooth egg custard made with heavy cream and gelatin and typically served with fresh fruit or a fruit purée. 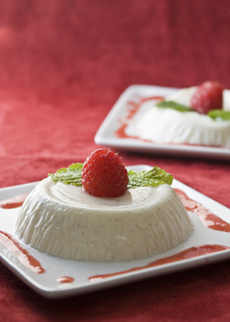 Panna cotta originated in the Piedmont area of northern Italy, a region known for its cream. Panna cotta. Photo courtesy Driscoll’s. Pronounced poe-duh-CREHM and French for “cup of cream,” it is an eggy, soft and smooth custard made of equal parts of cream and milk and an extensive amount of egg yolk—e.g., 6 yolks per 2 cups of cream/milk (or half and half). It is traditionally served unadorned, except perhaps with a decorative candied violet, in a small, lidded porcelain cup (the “pot”). The porcelain pots can be plain white or colored ceramic; or they can be ornately-decorated fine porcelain. Pots can be single- or dual-handled. Note that while pot de crème can look like mousse to the untrained eye, pot de crème is a dense pudding while mousse is whipped and airy. Pot de creme. Photo courtesy Seduction Meals.